As you can imagine, I’ve learned an incredible amount about healthy living from being around my fitness queen daughter all the time. The problem is that I don’t usually apply what I learn, but I was so inspired by seeing her perform in her first pro bodybuilding competition last weekend, that I’ve decided to make health and wellness a renewed priority, and that’s the reason I partnered with Aetna to share information about the Healthiest Cities and Counties Challenge. The Aetna Foundation surveyed more than 2,000 Americans for their viewpoints on a variety of healthy living topics, and the results were a bit surprising (at least to me). Nearly 77% of respondents considered themselves somewhat or extremely healthy, yet the reality with this country’s overall health is that half of all adults – 117 million – had one or more chronic health conditions, and one in four adults had two or more chronic health conditions as of 2012. (CDC) That’s a pretty shocking disparity! The survey results also show that half of Americans give their current city or county a health grade of C, based on factors like cost of living, access to health services, nutritious food options and crime and violence rates. Two out of five think their area isn’t as healthy as other cities, but have hope for and are willing to do something to make it a healthier environment. 1. Get 30 minutes of daily exercise. Regular exercise helps you feel more energized, and you can break the 30 minutes up throughout the day. Do jumping jacks or a high-step march during commercials (this is what I do). Make a fun competition with the kids about who can do the most sit-ups or hops on one leg, or put on some music and do silly dances or play freeze dance. When the music stops, everyone has to freeze. When it starts back up, dancing continues! 2. Drink more water and plan your meals. Before filling up on snacks, check to see if it was thirst first. Perk up water by adding slices of lemon or cucumber, or try sparkling water for a change of pace. Set goals for drinking water so that you hydrate properly throughout the day. My daughter uses this smart water bottle which notifies her through the app if she hasn’t sipped water in a while. If you do need a snack, a small handful of almonds, apple slices or baby carrots are great. Step away from work periodically during the day. Go for a brief walk, do some stretches or play with your pets. I have a new kitten who loves to pounce on me, jump on my desk and walk on my keyboard to let me know it’s time to play with her. 4. Put your smart phone and yourself in sleep mode. Develop a relaxing nighttime routine. It’s important to unplug at least an hour before going to sleep. I have my notifications turned off from 8pm – 8am so that I’m sure I won’t be disturbed when sleeping by an incoming email or Facebook message. Also, the blue light emitted from electronics makes it harder for the brain to shut down and rest. Partner with family and friends for a support system to help each other make healthier choices and stay on track. Start a garden, take weekly hikes or organize a community bike ride. The Aetna Foundation’s Healthies Cities and Counties Challenge offers communities the opportunity to improve their environments and make them healthier places to live. The Challenge hopes to have 50 cities in the final round, and all finalist cities will receive a $10,000 seed award to help them implement their project. Visit HealthiestCities.org for more information and follow the #HealthiestCitiesChallenge on social media. I have been doing the whole micro break thing. It really does help when I feel so overwhelmed. I needed these today! Working towards a healthier lifestyle isn’t easy for me! Thanks for linking up with us at Welcome Home Wednesdays, hope to see you again this week! Great tips — I need to try these! Thanks for sharing at Merry Monday! Plan your meals is sooo important. When it’s not planned out, you just grab whatever is quickest and it’s usually not the healthiest option to keep you on track. Probably, to me, the most important is to reconnect with people and take a break from the smartphone — and electronics. Good tips! It is easier to exercise when you have dog since you need to walk him out. Depending on my mood, I will do yoga, dance or just a big walk around the neighborhood. There are days I have more time and I will be active for 1 hour and some others, I can have only 30 mins. Also don’t forget that house chores help with exercising as well. Great post! Have a wonderful week! Love your tips! I follow most of them! I’ve reached a plateau, working really hard to get out of it! I’m pretty focused during the day, so I find it hard to set a time to do all these things. I definitely need to keep myself fit. What would you suggest? I most of the time moving away from what I need to do and stay on focus. I need time to finish everything on my plate for the day. I have everything in me and I neglect the time to take time-outs. These are all great tips!! I need to incorporate a couple of these into my daily life!! I am a school teacher and I am looking forward to the summer and the new opportunity I have to get healthy. The end of the year can be so hard and stressful! There’s an app I’m using on my phone to make it better for your eyes at night time, twilight I think it’s called. You can really notice the difference too – I can stare at the screen for ages in bed without it, with it I am able to get sleepy a lot quicker. These tips are sooooo useful! Thanks a bunch for sharing this knowledge! I have got to get a night time routine going. Sleep is where I need the help with. I like the tip of unplugging an hour before sleep time. I’m going to work harder at that one. I think drinking water is very important. It’s actually the only thing I drink too. I love water and all the great benefits of it. I am working hard on numbers 3 and 5. In fact, I’m walking a 5K tomorrow with my team that keeps growing. Accountability is everything. I’m a nutrition major in school and I can’t stress the importance of getting 30min daily exercise. it’s so importance for energy and overall wellness. I love the tips you mentioned on how to break them up during the day. Great idea! These are all keys to living healthy. I need to exercise more. These are awesome tips. I always make sure to get enough sleep and I drink plenty of fluids. Smartphones are already part of the DAILY NEEDS of every individual nowadays but having a break to it will give you a rest and also a quality time with your loved ones. Most especially a time for yourself. I just ordered all of us activity trackers so we can keep up with each other and make doing everyday stuff a little more interesting. Oh my goodness that tip for putting yourself and your smart phone in sleep mode is so important. I see it as a huge factor in our country’s overall health decline – it is not just how we look but how we feel and our phones I think are making us feel worse. I’m doing really good with the water as of late and just need to push for that 30 minutes of daily exercise! Wow, those survey results are surprising compared to the facts alone, but maybe it’s because most of them simply don’t feel “sick” at that time. I’m not sure about the 30 minute daily exercise if it can fit into my schedule but the others seem feasible. Thanks! I am focused on drinking more water everyday and exercising more! Those two things seem to be making a big difference in how I feel, look, and even in my energy and overall wellness levels! Shared both your’s & your daughter’s posts. I’ve been really trying to improve my health and lifestyle over the past couple of years and have been really focusing on it this year. I have a toddler and it’s important to me to teach him to be healthy and the best way to do that is lead by example! He actually put down an ice cream bar yesterday and finished a sliced apple instead – what? I bet it’s awesome to watch her go compete. And I’m not surprised at the average self rating being a C. I think that’s what I would rate myself too, and I try to be healthy. Its’s just so easy to stray. Really great tips. I’ve upped my water intake a lot in the past few months and I really do see the benefits of it. I make sure I eat healthy and balanced meals everyday, aside from that, I also love jogging around the neighborhood to keep myself physically active. These tips are definitely effective. It’s good to be involved in your neighborhood as well. These are wonderful tips for staying on track. I’ve started refilling my water bottles with juice and homemade unsweetened ice tea so they are always in the refrigerator ready to drink. I like the fresh fruit in the cereal in the picture above. The nicest thing about eating healthier, exercising properly and drinking healthy liquids and water is that the weight eventually goes away. I’m enjoying the benefits and it sounds like you are, too. I got an Apple Watch a few weeks ago and when it reminds me to stand each hour, I get up and do jumping jacks for a minute. I figure every little bit helps! I’m trying to make healthier choices! I was really opposed to drinking so much water, but if I add a bit of flavor – cucumber, lemon, etc – even a subtle amount, I find I am more inclined to drink it. I need to drink more water.I am really bad about it. I need to drink water, I am horrible about it. These ae great tips. I know a lot of people who could benefit from them. I really need to start drinking more water again I have been slacking the last month or so and it makes a big difference. I don’t know why it’s so hard to make healthy living a priority. I almost feel guilty if I take the time I need to do healthy things like exercise and such. Fantastic tips. I definitely need to drink more water and plan meals. I tend to eat out way more when I don’t have a meal planned. I think these are great tips. Water is the only thing I really drink, so I’m glad I’m good with that. I know I could exercise more than I do now though. I am terrible at drinking tons of water. I am such a coffee girl that I tend to fill up on that and have no room for the important stuff. The best thing about the tips you shared here is that they are easy to do and they are things that can be continued over the long haul. These are some great tips! I started drinking a gallon of water a day like geeze going on 6 years ago and omg! Crazy how many things water fixes! I encourage everyone to chug water daily lol…. It will change you life. These tips are all so important to incorporate into your daily life. Despite knowing this, I really struggle to do it. I’ve noticed I do much better on the days I work from home, but I’m also less productive as far as my work is concerned. Life really is a balancing act and I wish more employers cared about employees taking care of themselves properly. I bought a big jug to keep in the work fridge. I fill it up when it’s empty and now I have no excuse for not drinking more water at work. Sometimes it takes being inspired by someone to push us into better habits! These are great tips that I am trying to improve day by day. Life is so busy that it’s all too easy to neglect them :(. 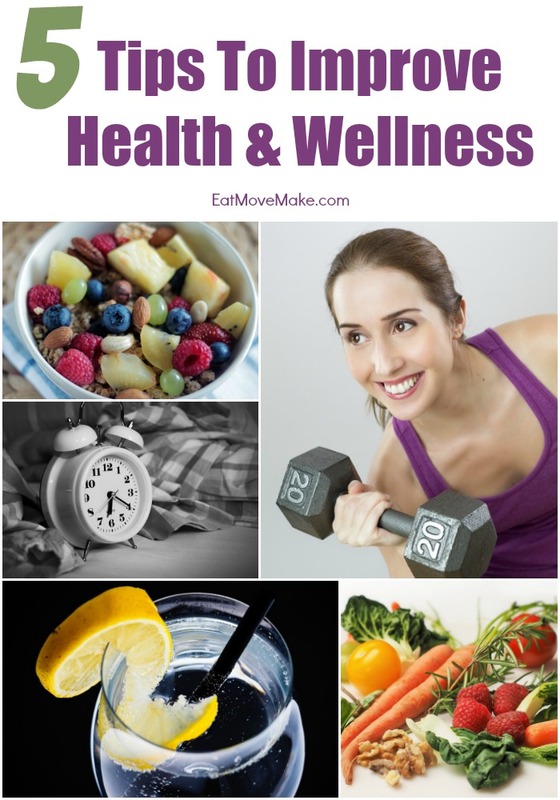 These are some great tips for overall health. At my age, that is more of what I am interested in, and I know my husband is similar. Drinking more and planning meals is key! Both of these things help prevent failing! I’m always on the go and get little sleep. I’m trying to make better changes for healthier living. Such great and easy tips, I just recently bought a water dispenser which has really been helping me with my water intake every day! Man, when I stay on top of planning meals and drinking water, everything else falls into place. When I slack, everything falls apart! It is important to lead by example. I try to find things we can do together to get some exercise. these are some great yet simple tips to follow and doing so can make a huge difference. Meal planning is a great way to control your meals. I have been drinking a lot more water lately and i am noticing a difference in my skin. I have been leaving my smartphone in a different room when i go to bed. I used to check it when i would wake up during the night. Now it can not distract me. I have been living a healthier lifestyle this year. I like to do 30 minutes of exercise in the morning to start my day. I need to take note on the cell phone in bed part… it’s a habit and sometimes keeps me up at night. Sleep is so important! I agree with all of these. I think it’s so important to focus on your health. I’ve been eating a lot more healthy lately and I’ve been trying to exercise more to. I know I could use more work on exercising more than I do though. I love how simple and easy these tips are – very do-able! I need to make sure I get out on my daily walks and keeping up my water intake. Water is a huge factor in being healthier, I know I felt healthier simply by increasing my water intake to above 64oz a day – I can’t recall how may ounces exactly but it was certainly over 64oz a day. I just felt like my head was clear and my body was more refreshed feeling! These are great tips and I’m already doing all this, except for number 4. I need to teach myself to take micro breaks. I have been working on drinking more water. And now that warm weather is here I am getting out with the kids and moving more. It’s hard to keep at it at first, but like anything it becomes a habit and then a lifestyle. I work out rigorously almost everyday and I”m 70! These tips are great and so important. What they say about an ounce of prevention is so true. These are all great tips that are beneficial for everyone, regardless of age, gender or current health situation. Drinking enough water is something I constantly struggle with. When I started adding lemon and blueberries to my water it made a world of difference. I’m terrible about staying hydrated but now it’s much easier! These are awesome tips! I need to work on getting my thirty minutes of activity everyday-I teach, so I’m stuck in a classroom for most of the day but then when I leave I’m totally exhausted! I’m going to have to power through and get in a good workout a couple of days a week! Planning my meals definitely helps me eat healthier! These are some really great tips! All too often, we take our health for granted! People don’t drink enough water. Bring on the water! Great tips. I like the one about taking a break. When i am in writing mode I find if i get up and walk away for a few minutes and get a drink of water or so some squats i feel better. I am trying so hard to eat right, at least more nutritiously. I drink a lot of water during the day and I’m exercising probably 20-25 minutes a day. I really need to drink more water. I know it’s important, but I don’t really like water too much. This post is so inspiring. I need to drink more water for sure. Some great tips there. I am guilty of not drinking enough water. I need to try harder! Thanks for the great tips. I need to drink more water and make sure that I do my workout every day. Love these tips!! It is amazing the difference small changes can make in your life. I really need to work on getting more sleep. I also need to work on getting OFF my devices at least an hour before bed. I’m really bad about that! I’ve been really trying to focus on drinking more water and eating a lot more fiber. I need more hydration, and the fiber will help me feel full. These are great tips! People too often forget that you need plenty of water to be healthy. Smartphone can really be a big hindrance in getting a god night sleep so it is better to put it away. These are great tips! Ugh tell me about it. I am so bad about turning it off and almost always get notifications or texts that wake me up!